Already in the mid 80s the Corvus Corax minstrels were roaming as street performers throughout the country (East Germany). 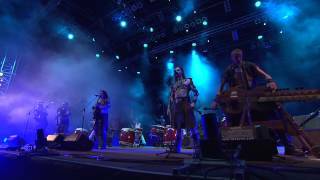 They found fragments of medieval-secular music in old writings and reworked them, in a completely new way. 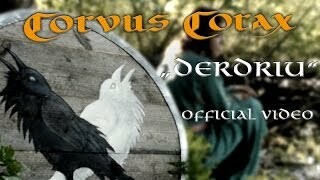 Many medieval bands have sought to emulate the style of Corvus Corax and there is certainly no medieval market in Germany where the songs from Corvus Corax are not played. 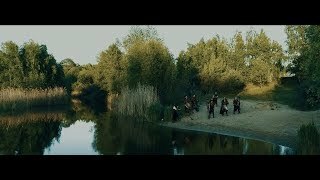 The 4 bag pipe players and 3 percussionists of Corvus Corax have created an unmistakable sound, which unites the haunting medieval melodies with hypnotic dance rhythms and drives audiences wild every time they play. 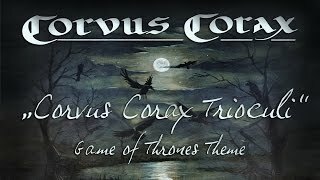 Corvus Corax have long been acclaimed for their legendary concerts and few can avoid getting caught up in the ecstatic power of their acoustic performance in their fantastic self-created costumes.